Designed by an aerospace engineer, this scoop’s made to tackle the toughest quart tubs. Ice cream tastes best when it's fresh from the freezer. Scoop can't handle it? Cue screaming (not the good kind). 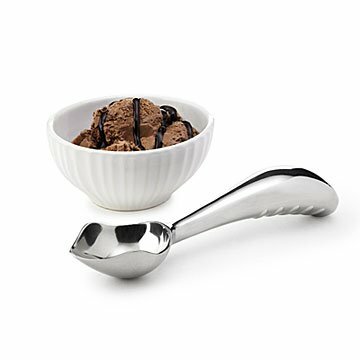 Designed by an aerospace engineer with an appetite for rock-hard frozen treats, this ergonomic scoop's made to cut ribbons like butter from even the toughest quart tubs. Its curved, heirloom-quality stainless steel handle promises years of successful scooping, plus easier maneuvering than similar tools. Know what else that means? Lots of instant gratification—all with less strain to your wrists. Made in China.